It seems as though all of the major basketball news from America this week is focusing on money. Yes money makes the world go round but in the world of sport, it can often be the case that hard work, effort and tactics will overcome a team of highly paid players. There is no doubt that hunger is the key in many games and duels but of course, if it was really that simple, teams would be looking to pay their players as little as they could. There needs to be a trade off at times and with the announcement of the massive NBA TV deal, you can bet that there will be plenty of players pushing for wage increases and big money in the near future. The rumour mill has kicked into gear saying that Kenneth Faried of the Denver Nuggets is one such player that will be enjoying himself all the way to the bank. This is because he is being tipped to sign a four year deal that will stand as a $50m contract extension with the Denver Nuggets. With that sort of income he could be paid in gold nuggets and while a number of media outlets are saying it is a done deal, there is yet to be official confirmation of the agreement. 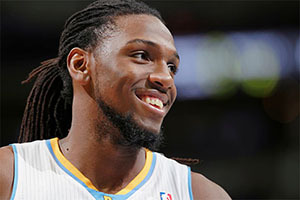 The club only has until the end of the month to agree a new contract with Faried and if they don’t he will gain the right to become a restricted free agent in the summer of 2015. The player may be willing for this to happen but if he can get a sizable income without having to move or uproot, you can see why signing a contract and getting a few years guaranteed service will be a good thing. If this does turn out to be the case it will cap a remarkable summer for the player. He was one of the Team USA squad who travelled to Spain and came home with the gold medal from the 2014 FIBA World Cup. While the American team were tipped as favourites for the tournament, they still had to take care of business and they managed to do so in the most convincing of manners. You only have to look at Spain, who were hotly tipped as second favourites for the tournaments at the quarter final stage to realise that the expectations of bookies and fans count for very little on the court. No one gave the French side much hope, and the French side wasn’t made up of players earning the same high salaries that some of the Spanish sides would have been earning so you can see that money isn’t everything in the modern game. For all that though, Team USA absolutely destroyed the opposition and Faried will enjoy his gold medal for the rest of his life. The player also experienced a career best last season when he grabbed an average of 13.7 points per game as well as delivering 8.6 rebounds per game. The fact that Faried has managed to show a string sense of improvement in recent times, he will be looked at closely by people who will expect the player to kick on even further. He will be a point of emphasis for other teams to game plan against, whereas before maybe he wasn’t. It’s what every player goes through that reaches that level. Star players, once they have an effective season, the next season, teams start double-teaming them and game-planning specifically for the strengths you bring to the floor. He has to learn how to negotiate through that. If Faried wants to be a top class player earning top class money, this is what he will need to do.